Getting your pool built in the fall makes it accessible and ready to go once the warmer weather comes along. So, you don’t have to wait in the hot summer for your pool to be built. 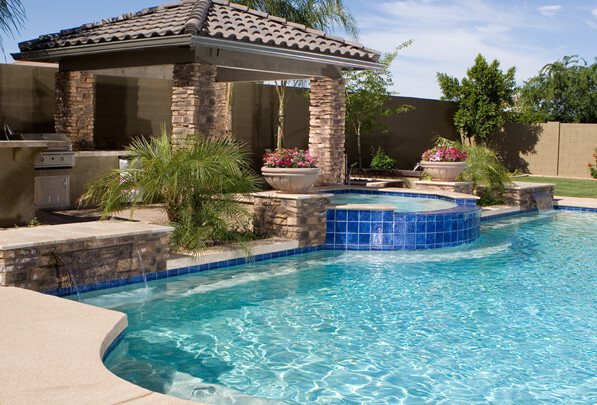 The autumn months are the best time to build a pool since you can pretty much guarantee less delays with more predictable weather especially in Arizona. Also by waiting until the weather starts to cool, you miss the height of pool-building season! When it’s extremely hot outside it can make it difficult to properly cure concrete. On hot days, too much water is lost by evaporation from newly placed concrete. If the temperature drops too close to freezing, hydration slows to nearly a standstill. Under these conditions, concrete ceases to gain strength and other undesirable properties. In general, the temperature of the new concrete should not be allowed to fall below 50 Fahrenheit (10 Celsius) during the curing period. Fall also allows for a much more flexible timeline than if you built in the spring or summer. Building in the fall ensures that even with possible setbacks, your pool will definitely be ready for you once the warm weather arrives. Plus, fall weather is more predictable and the ground is typically dry. These conditions mean faster installation, less ruts from machinery, and more comfortable workers. Contact us for a complimentary design consultation!